Although we treasure each of the Torah scrolls housed in our Ark, it is our honor to serve as the custodians of a Torah that is a survivor of the Holocaust. 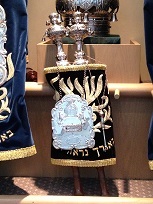 Sefer Torah MST#184 began it’s journey from a synagogue in Mlada Boleslav, Czechoslovakia. During the Nazi occupation of Czechoslovakia, the Jews from dozens of congregations were forced to leave behind their synagogoues. These were in German hands by the time the Pogrom of November 1938, when synagogues across the occupied lands were vandalised and looted or burned down. In almost every case, the ritual treasures of these synagogues were destroyed or lost. After this, Jewish civic leaders mobilized to collect, sort, catalog and store the remaining pieces of Judaica. Artifacts from communities including Mlada Boleslav were brought to Prague, consisting of over 5,000 religious objects and over 24,000 prayer books. Many of these items are on display at the Jewish Museum of Prague. Included in this collection were 1,564 Torah Scrolls. In 1963, a British art dealer brokered a deal which transferred all 1,564 scrolls to Westminster Synagogue in London. There it was determined which scrolls were kosher and which were ornamental. Memorial Scroll 184 was entrusted to Oheb Sholom in 1981. The Scroll is on loan to us thanks to the Westminster Synagogue in London.